Whale fossil with four legs found off the coast of Peru. A Whale That Could Walk! A depiction of what the creature might have looked like. 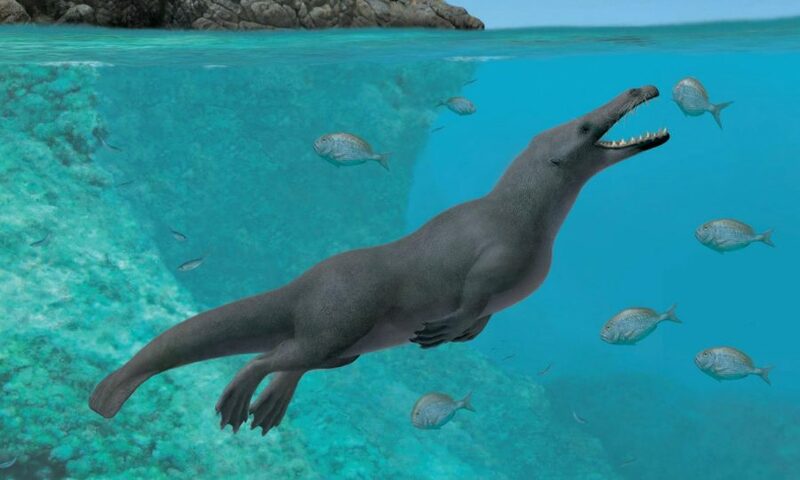 New species Peregocetus Pacificus Latin for “the traveling whale that reached the Pacific,” is making its way onto shore! A fossilized whale discovered in 2011 is now making waves bringing new insight into the whale species. This new webbed foot, hoofed toed animal swam around the ocean nearly 40 million years ago. This new species has given new information about how the whale’s species spread throughout the globe according to a published study released Thursday. Paleontologist Mario Urbina discovered the fossil off the coast of Peru. His team was able to recover most of the skeleton including the legs, jaw, some of the spine, and tail. His team dated the fossil to exactly the Middle Eocene Epoch, 42.6 million years ago. Drawings of the skeletons of the creature. This fossil is the oldest whale located in that part of the world outside of India and Pakistan. “This is the first indisputable record of a quadrupedal whale skeleton for the whole Pacific Ocean, probably the oldest for the Americas and the most complete outside India and Pakistan,” stated by Dr. Olivier Lambert co-author of the study. According to fossil evidence, the creature would have been 11 feet long and would have been well adapted to both land and sea. 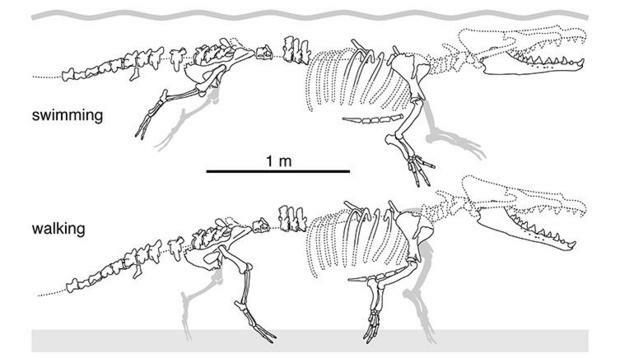 It is already well known that whales and dolphins evolved from four legged land animals, but how they got from South Asia to the Americas remains a mystery. Scientists think that when the Africa and South America continents were much closer, the wale would have had an easy trip.